Like many others I’m a Roger Ebert fan. The great thing about him isn’t that he can dig deeper into a film than other critics or film buffs — it’s that he never fails to properly position a movie within the grand scheme of things. The truth he sees seems to resonate with me. I appreciate that he sees movies for what they are, and situates them within the right context — horizontally within the cultural mores of their own time, and vertically from one era to the next. And his greatest gift is that he usually does so without grinding an ax. Ebert’s review of The Baby Maker (read it here), written in 1970 during the film’s theatrical run, has it pegged. Surprisingly, he spends much of his essay writing about another review of the film, one penned by a critic in a free paper who attacks the film for everything about it she believes to ring false, dismissing the film as just another failed and ultimately shallow attempt by Hollywood to make a movie with counter culture street credibility. While Ebert recognizes the validity of the argument, and is winkingly careful to compliment her prose, he nevertheless feels compelled to champion the film’s good qualities, especially the performance of the startlingly Barbara Hershey. 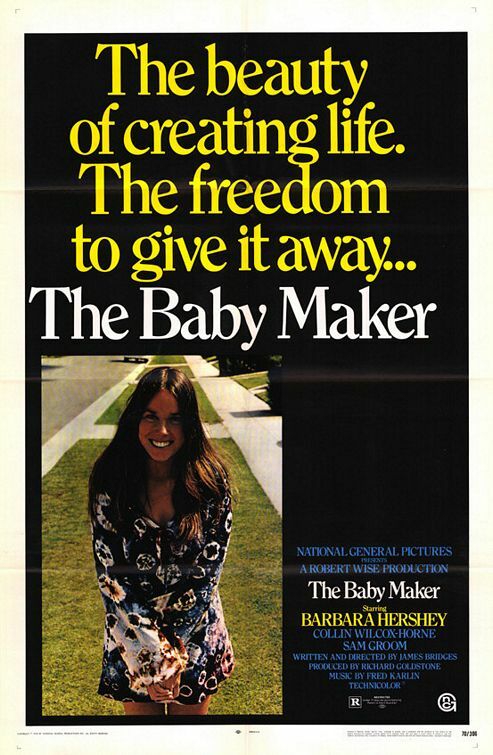 I just got a copy of The Baby Maker (via Warner Archive DVD), which tells a deceptively simple story, though one in which we can clearly see the potential landmines: Suzanne and Jay Wilcox (Sam Groom and Collin Wilcox-Paxton), a middle class couple unable to have a child of their own, hire free spirit Tish (Barbara Hershey) to have their baby. With artificial insemination was still a decade away, the husband and the girl are compelled to a sexual relationship in order to facilitate the pregnancy. However Tish has a boyfriend of her own, Tad (a nearly unrecognizable Scott Glenn), whose own misgivings parallel the neurotic uncertainties of Mrs. Wilcox. The film follows its four main characters from their first meeting through the birth of the child, and on to what happens afterwards. It bills itself as comedy, though it’s the variety that asks you to smile knowingly a great deal more than it wants you to laugh-out-loud. The Baby Maker is the sort of movie that you can talk about for five minutes or five years. It asks many more questions than it could possibly hope to answer, and does so by juxtaposing (in your face at times, and at others, quite subtly) numerous cultural antagonists of the day: husbands and wives, boyfriends and girlfriends (or simply men and women, if you like), the young and the not-quite-so-young (particularly at a time like the late sixties when the differences between generations were quite pronounced), and especially the uptight and neurotic bourgeois versus the free thinkers of the counter-culture movement. The script has enough sense to not take sides, though there are moments (like the toy store scene) when it almost strays across the line. Watching the film today, we run the risk of simply dismissing it as dated, it’s subject of surrogate pregnancy no longer the hot-button that it was in the seventies. The medical insight it offers regarding pregnancy is positively archaic, and it suffers throughout from cultural attitudes and cinematic tendencies (the song-score) that the world has long since left behind. It favors a broad brush rather than a fine one, touching on a checklist of issues and not digging deeply into any. For example, there’s a tense moment between Tish and Mrs. Wilcox concerning breastfeeding that the film brings up and then decides to simply leave alone. In such moments I wished the script had more guts. Ebert knowingly points out that “It could have been awful, but it’s actually pretty good,” and in saying so he’s recognizing the pitfalls of the subject matter, and of poor acting. The Baby Maker really owes whatever degree of success you’re willing to allow it to its actors, who could have ruined this, but instead do quite well. I first saw the young Barbara Hershey in 1969’s Last Summer, so she wasn’t a revelation to me, but she undoubtedly carries this film and will be a surprise to those who are only familiar with her work of the last two decades. She’s innocent, vulnerable, honest, and ultimately unknowable. She gives Tish a sense of self that seems fragile at times and character-defining at others. The supporting cast is certainly able, but this is Hershey’s film from start to finish. The whole thing builds up to the birth scene, and it’s a winner. For the duration of the sequence we set aside all of the underlying stress the film works so hard to create and just focus our attention on Barbara. The baby is delivered via natural childbirth per Mrs. Wilcox’s wishes — or at least as close as one could get n a 1970 hospital. Hershey is quite literally strapped into the stirrups and covered from head to toes with an unending supply of heavy white blankets, while the doctors, nurses, and Wilcox’s are practically invisible behind white surgical scrubs and masks. All we get to look at is Hershey’s face as she pushes through her contractions, and she delivers a winning scene. Ebert tells us that audiences cried and applauded the climactic moment, and it isn’t difficult to believe. After all, such a documentary presentation of childbirth was relatively uncharted territory for a major studio picture of the day, and the actress is up to the challenge. Having personally been right there through a few births myself, I can confide that my wife’s experiences were a great deal louder and somewhat more messy — but that can be forgiven. I’m sure the filmmakers would rather have joyful audiences rather than those covering their eyes or marching out.